? Life is good with GrabPay! Live a good life with special promotion! Privilege for credit/debit card(s) holder from participating banks. 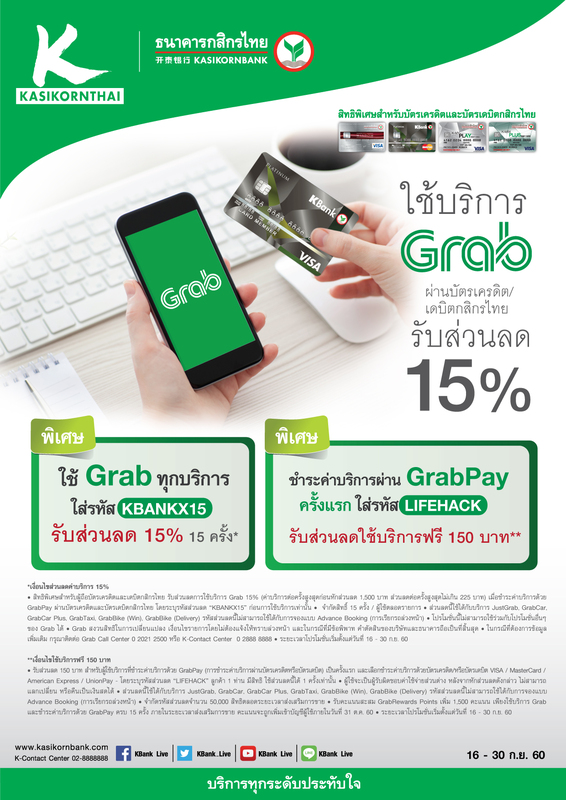 Users receive 15% discount on Grab services (1,500Baht maximum fare before discount, maximum discount shall not exceed 225Baht) when paying via GrabPay (payment for Grab’s services with credit/debit cards) with credit/debit together with specified promo code of participating banks. Users must apply promo code of participating banks when paying for Grab services with GrabPay before actual usage. 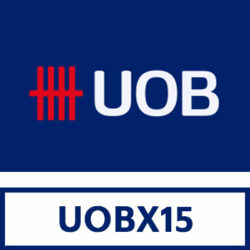 Limit usage to 15 times per card per users throughout the entire promotional campaign period. This promo code is only applicable for JustGrab, GrabCar, GrabCar Plus, GrabTaxi, GrabBike (Win), and GrabBike (Delivery). This discount code is not applicable for Advanced Booking. This promotional campaign period is from 16 – 30 September 2017. This promo code cannot be used together with any other promotional campaign. Grab reserves the right to modify any terms and conditions of the co-marketing activity without prior notification. Grab reserves the right to arbitrate any controversy that may occur as a result of this activity. For more information please contact Grab Call Center 02 021 2500. 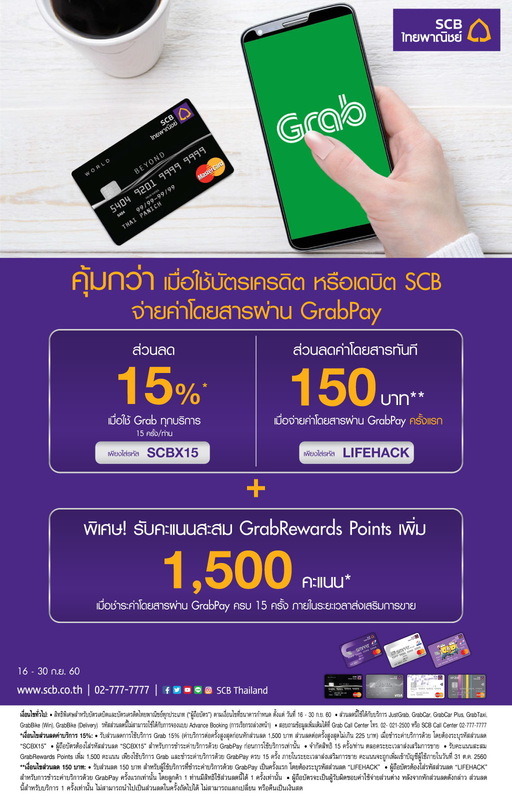 Users receive 150Baht discount when paying Grab services via GrabPay (payment for Grab’s services with credit/debit cards) for the first time and selected to pay with VISA / MasterCard / American Express / UnionPay and apply promo code “LIFEHACK”. 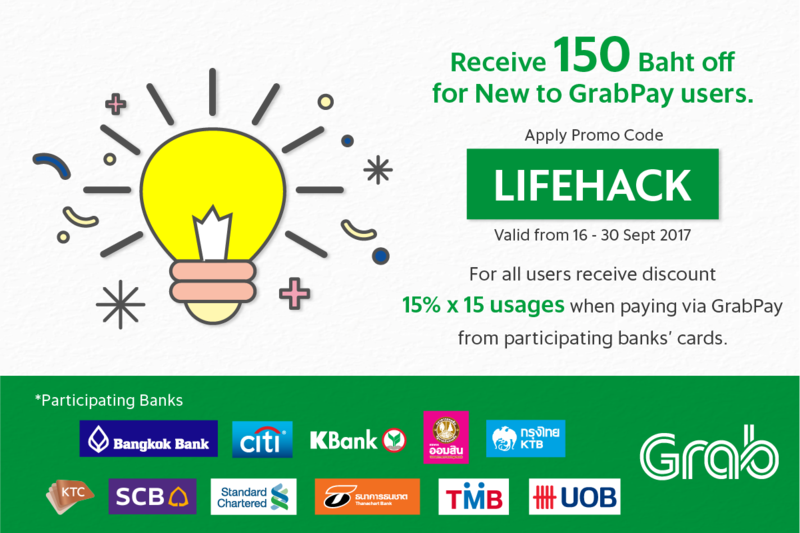 Eligible users must be New to GrabPay and apply promo code “LIFEHACK” when paying for Grab service with GrabPay for the first time only. Users are eligible for this promo code only once. Users are responsible for extra charges that may occur after discount reduction. This promo code cannot be used in future Grab usages and cannot be exchanged or rebate as cash. This promo code is only applicable for JustGrab, GrabCar, GrabCar Plus, GrabTaxi, GrabBike (Win), and GrabBike (Delivery). This promo code is not applicable for Advanced Booking. This promo code is limit to 50,000 usages for the entire promotional campaign period. Receive extra 1,500 GrabRewards points when users have completed GrabPay usages up to 15 times within the promotional campaign period. The additional GrabRewards points will be added in users’ account within 31 October 2017.